Mrs. G TV & Appliances is a third generation family owned retail showroom that has developed an outstanding reputation for over 80 years. It all started in 1935 when Abe and Beatrice Greenberg opened their own plumbing supply store called New Jersey Plumbing on East State Street in Trenton, New Jersey. Abe and Beatrice hung on during the war years, but by the time the returning soldiers settled down, it was clear that the shop could no longer limit itself to just plumbing supplies. They expanded their product offerings and became appliance dealers for the Trenton, NJ area. Abe and Beatrice became known to their customers and to the community as Mr. and Mrs. G. Mrs. G loved being on the floor with her customers and Mr. G was quite comfortable behind the register. Mrs. G was no doubt the face of the business and the primary draw of customers. By the 1950's, the Greenbergs decided to capitalize on her appeal by giving their NJ appliance store a new name, "Mrs. G TV & Appliances," and a new logo that includes the now iconic drawing of Beatrice's face. Today, the name and logo are synonymous with quality appliances in NJ and PA.
With growth comes challenge and in 1972, 35 years of their hard work was nearly wiped out when a gas line explosion leveled the store. There was no stopping the Greenbergs; in just a few days they reopened in their warehouse while they shopped another location. At that time, the Route 1 corridor was the fastest developing commercial strip in town and the perfect spot for the new Mrs. G's store. The Greenbergs knew this was a convenient location for their New Jersey customers, and their proximity to Pennsylvania also opened up the potential for expanding their TV and appliances sales to a new market. In 2000, Mrs. G recruited her granddaughter, Debbie Schaeffer, to run the business. Today, with Debbie's insight to introduce luxury appliance brands to the store, the 20,000 sq. ft. showroom has become a destination, proudly displaying over 70 brands as well as a Sub-Zero Wolf Living Kitchen, 8 live kitchen displays to touch and feel and cook on, and a selection of products from brands such as Miele, Viking, Thermador, Bosch, GE, Monogram, Whirlpool, Electrolux, Jenn-Air, Samsung and much more. The sale of outdoor kitchens and entertainment spaces is also unique to Mrs. G's, offering grills and accessories from Viking, Lynx, Wolf and Weber. The showroom has also become a popular venue for community & professional events hosted by both Mrs. G's and various local organizations and businesses. 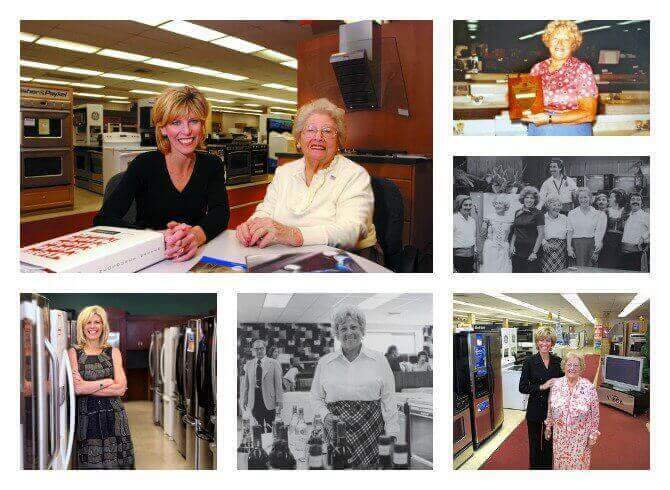 Debbie uses the same philosophy of her grandparents: taking care of the customer, having a great selection of brands in the showroom and keeping the long tradition of supporting the community and local charities. Her business practice has influenced other independent retailers at the local, statewide and even national level. Debbie and Mrs. G's have received many honors and awards including Princeton Regional Chamber of Commerce Innovator of the Year Award 2011, Legacy Award for Women in Consumer Electronics 2010, Princeton YWCA Tribute to Women Award 2010, Mercer Regional Chamber of Commerce Outstanding Small Business Award 2009. Debbie has been rewarded through the numerous organizations she supports through Mrs. G's as well. The store has also hosted their "Paint Our Fridge Pink" contest to benefit the Susan G. Komen Foundation of Central & South Jersey. The contest, which is open to kids in middle through high school, is an opportunity for students to be creative for a good cause. A life-long tennis player, Debbie also supports the National Junior Tennis & Learning of Trenton each year for their gala. Debbie plans on keeping Mrs. G TV & Appliance as a foremost appliance dealer and electronics store in NJ and PA for many more to come.